The vastus lateralis is one of the four muscles that make up your quadriceps or frontal thigh muscles. The muscle originates at the outer section of the quadriceps, near the hip joint, and inserts at the outer part of your knee. The vastus lateralis assists the other quadriceps muscles in leg extension. Its position near your kneecap places significant demands on the vastus lateralis. In addition to assisting the other quadriceps in straightening your leg, the vastus lateralis plays a key role in knee tracking and alignment. Subluxing occurs when your knee cap slides out of its groove. Muscular imbalances between the vastus lateralis and the vastus medialis, the inner quadriceps muscle, make you susceptible to this injury, says Brad Walker, author of "The Anatomy of Sports Injuries." This imbalance creates an uneven pull on your knee cap, causing it to slide out of its groove. If your therapist determines that a muscular imbalance caused your injury, she may prescribe a stretching program. Stand in an upright position, and bend your injured knee. Hold your ankle and gently pull your heel toward your buttocks. Hold the position for one minute. Your vastus lateralis rehabilitation process begins with the RICE treatment -- an acronym for rest, ice, compression and elevation. If your injury is serious enough to prevent you from bearing weight, your physical therapist may prescribe nonweight bearing open-chain exercise, which keep your feet in a free position. The straight leg raise is an example. Sit upright with your legs extended, and lift your straight leg a few inches from the floor. Perform three sets of 20 repetitions. Your doctor or physical therapist might prescribe graded treadmill walking during the early stages of your vastus lateralis rehabilitation program. You begin at a zero incline. As your knee condition improves, your physical therapist increases the incline of the treadmill. 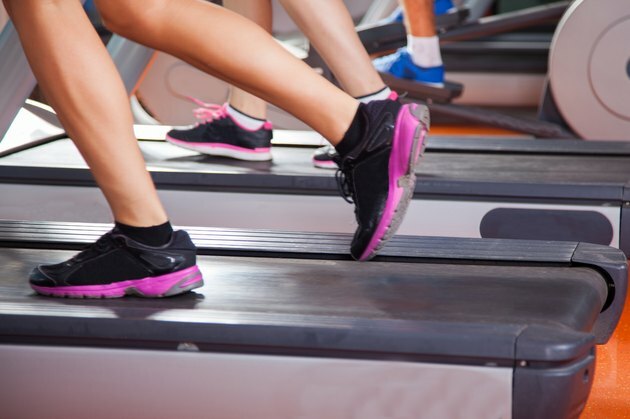 Increases in treadmill incline correspond to increases in vastus medialis oblique, vastus lateralis and biceps femoris activity, reports Gregory W. Lange, lead author of a May 1996 study published in the Journal of Orthopaedic and Sports Physical Therapy. Closed chain leg exercises, which are exercises that keep your feet in contact with the floor, engage the vastus lateralis as well as the other quadriceps muscles. Physical therapists prescribe closed chain body weight exercises such as squats and lunges for vastus lateralis rehabilitation. The squat, performed with both feet flat on the floor, might be easier during the earlier stages of rehabilitation. Add lunges as your balance improves. Stretch after your workout by standing upright, bending your knee and gently pulling your heel toward your buttocks.